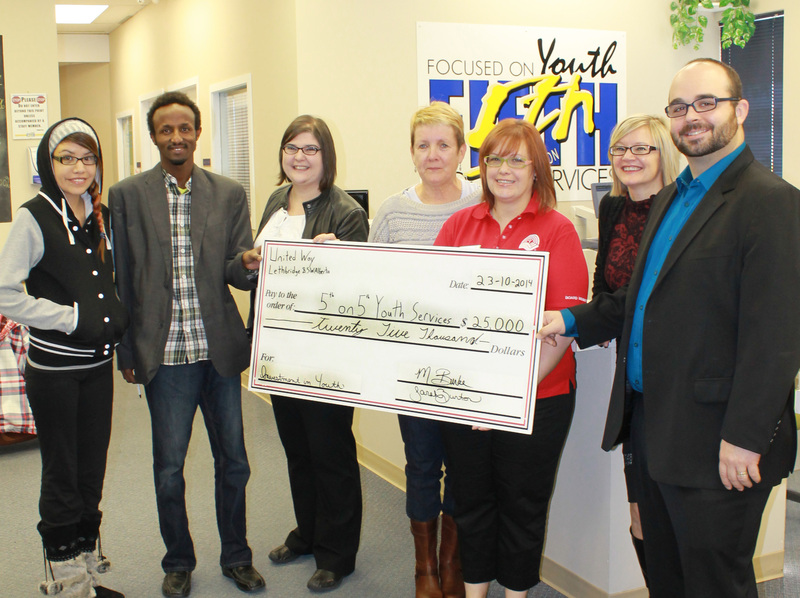 Volunteers from the United Way of Lethbridge and South Western Alberta have presented 5th on 5th Youth Services with $25,000 in funding to help support its business operations until January. The funds come from the United Way’s emergency reserve, which is supported primarily by payroll deductions from area employers and employees. “One of the goals of the 2014 United Way Campaign is to increase the number of businesses and organizations who invest in the community through payroll deductions,” said Jeff McLarty, the Executive Director of the United Way of Lethbridge and South Western Alberta. “Our support for 5th on 5th through this program is a direct result of people investing in our community through donations off their paycheque,” McLarty said. 5th on 5th has faced a number of funding challenges as it strives to maintain services to an estimated 8,000 youth each year. The organization has served more than 160,000 people since its founding in 1994. McKenzie added that even with this funding, and a recent cash injection of almost $75,000 from the province of Alberta, challenges still remain. In a typical year, 5th on 5th sees about 15,000 visits from approximately 8,000 people who are served by a variety of life skills and employment readiness programs. The per-person cost for 5th on 5th to be able to assist an individual is approximately $30 per year. More than 22 organizations in Lethbridge and South Western Alberta received program funding from United Way’s 2013 Fundraising Campaign including 5th on 5th Youth Services. The funding announced today is in addition to the regular grant 5th on 5th was selected to receive from the United Way Community Fund.